Our robust and reliable GMC-8022 gas detection control panels allows you to monitor a range of toxic and/or flammable gas detectors, flame detectors and smoke/heat detectors, simply and easily. 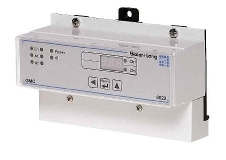 The unit has allowance for two meauring channels, two alarm relays and additional audible alarm output. It also allows for testing the alarms without the nedd for calibration gas. To prevent false alarm when calibrating the connected sensor probes, the alarm trigger of the analysis unit can be suppressed using a special menu. Cutting short; the Bieler & Lang GMC-8022 gas detection controller is a compact but powerful control system that combines simple operation with an extensive array of input and output functions.